Autonomous pods, apparently. Yes, I was surprised too, but that's what we were told at a consultation meeting today in Beccles, where representatives from Suffolk County Council's Public Transport team came to meet with the peasants of the land to discuss the future of Rural Public Transport. Delegates present included yours truly, the Mayor of Bungay, and a lady who confessed to not having used public transport for over 50 years. I don't think she was a Go Ahead director.... There were also people from Snape and Mutford, who like my village have no bus service at all, were looking for answers and a glimmer of hope. Joining the Council team were managers from BACT and CATS, who provide the Connecting Communities minibuses and Dial-a Ride services in the area. We were first asked, rather optimistically I thought, to say what we thought was working well in respects to rural transport. The unanimous consensus was currently nothing is working well so we quickly moved on to what improvements could be made. Various suggestions were made, but it all boiled down to one thing - reliability and accessibility, and by that I don't mean can you get a wheelchair on, which is law now anyway, but you must be able to get a bus to go where you want at regular times you can work round. Like normal buses in fact. Having to book in advance rules out spontaneous travel, and not being guaranteed your preferred time slot means it is completely unreliable, so unless you have the flexibility of a gymnast it is beyond useless. That triggered the expected "we haven't got any money" excuses, which I'd fully anticipated. Of course if the service was better more people would use it, revenue would increase, and so the service could improve even further. But it was here the chicken and the egg problem surfaced, not for the first time. That being no one will use a poor service until it improves, and no one will improve a service that no one is using. Catch 22. So how do you break the cycle? Well, if you have read the last couple of posts you'll understand why I wanted a brick wall to reshape my head against. How about Councils, communities and operators working together to create demand and supplying the demand which has been researched so communities get the bus they want and operators get the passengers they want. No! Seriously? Why hasn't anyone thought of that before!!! Trouble is the operators won't finance that research - I discovered that rather painfully a couple of weeks ago. The Council certainly won't, and the communities, quite understandably, won't believe they can achieve anything if the Council and operators appear disinterested. So having ascertained what needed to be done, but unspoken acknowledgement that no one wants to do it, we then got a fascinating presentation on the future of transport, or rather a lot of things that are happening elsewhere but are decades away from happening here. 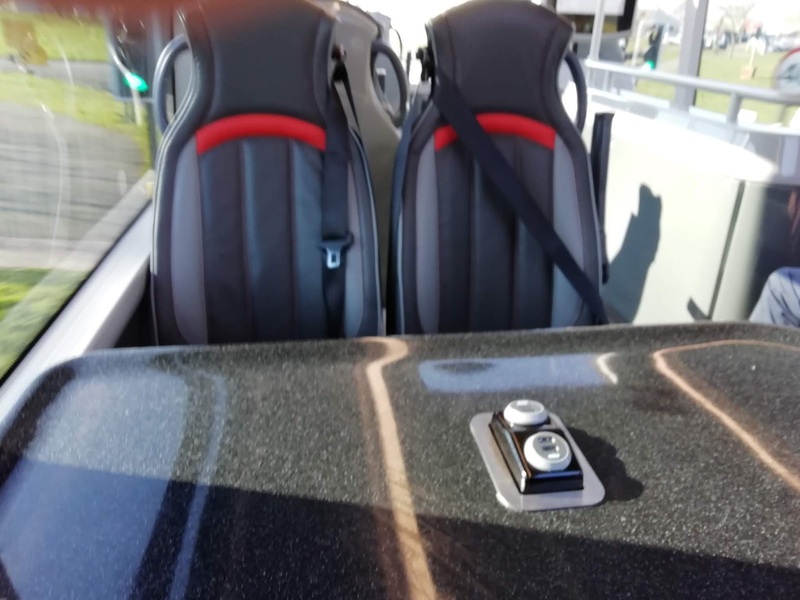 Electric buses - we haven't got so much as a hybrid in East Anglia - electric cars, and yes autonomous pods like they have in Milton Keynes and Heathrow Terminal 5. On top of E and M Tickets, contactless and bus tracking. At this point one of the gentlemen from Snape pointed out most of the area was yet to get a decent mobile phone signal, let alone think of autonomy. I know several people who have had problems getting a strong enough signal at bus strops to get M-Tickets to bring them up to show drivers, therefore having to pay again. I asked the guys from Snape to let me know when their pods arrived so I could do a write up on them. Might not be next week. Can we please get the basics right first. There is no gimmick in existence that can make up for not having a bus in the first place. 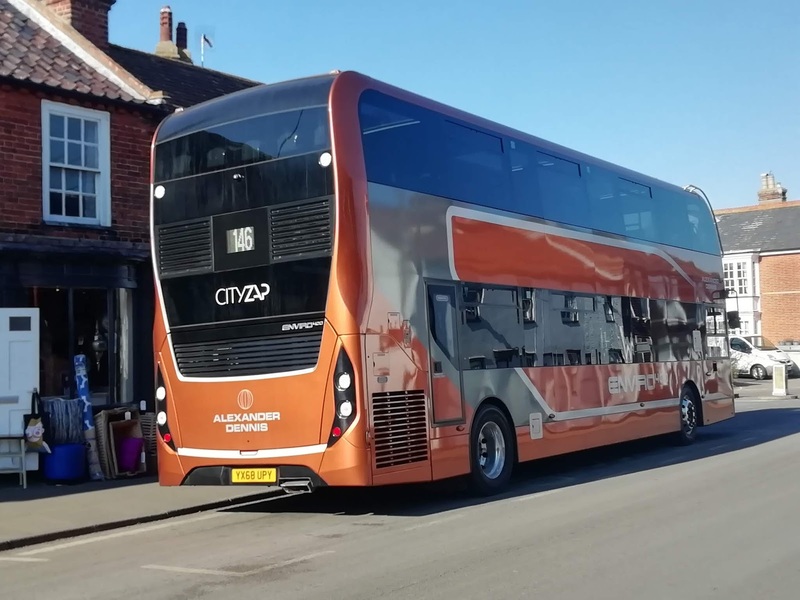 The Snape team said they were working within their community to get a regular band of passengers together to block book the Connecting Communities minibus. That's a great idea, and the sort of enthusiasm needed. Unfortunately if they did book the bus that means those who already regularly use it wouldn't be able to, and the manager of CATS conceded that point. So if one person travels it is at the expense of another. As business models go it's not going to win any awards. But use a bus that's resting between school runs to operate that journey for Snape, and suddenly everyone's a winner. I'm grateful to Anonymous who posted after my last post to tell us about what Dorset Councils have done - take a look. I read that post out, which shows if there is a will there is a way, and yes, communities WILL take responsibility for their own bus service if the support is there. But if I'm brutally honest I can't see it happening here. It could, it really could, but no one is prepared to say, yes, we'll give that a go. I heard more than once the Council Reps responding to suggestions "how can that be financially viable?". When they said there would be a £700k shortfall in the transport budget over the next four years I suggested a £5 levy added to Council Tax, which would more than cover that shortfall. The argument that non bus users shouldn't have to pay for bus subsidies came up. My Council Tax pays for leisure centres that I don't use, and a whole ream of other services I could use but choose not to. Why shouldn't buses be added to that list? Then they would be there for people who did choose to use them. If you're paying £1200 a year in Council Tax another fiver isn't going to make much difference. Concessionary passes were mentioned, with the vast majority agreeing that there should be some contribution from pass holders, either in paying a flat fare or an annual fee for the pass. Unfortunately that would require a change in legislation, which won't happen as it will be deemed a vote loser. Unless you're Suffolk County Council, that is, who have decided the best way to increase patronage of community buses is to cease accepting concessionary passes full stop. When asked why I was told that because some areas couldn't accept passes (no idea why) to make it fair for everyone no one would be able to use passes. I'm not sure if anyone suggested that passes be accepted everywhere, obviously that would be problematic. Of course it's perfectly fair that those without a regular bus service should have to pay when those who do, don't. Yes, that's fair. I asked about the legality of that, since Connecting Communities is registered as a local bus service. However, and I was told this with a straight face, because they are bookable (they HAVE to be booked) that makes them the same as National Express so they don't have to accept passes. That's right, Mrs Miggins going from her tiny hamlet to get her hair done in Saxmundham is the same as Auntie Gladys getting the coach from London to Plymouth. Except Gladys knows when her coach will leave, when it will arrive, she will definitely be able to go when she wants and it will take 5 hours not 15 minutes. It seems lost on SCC that Connecting Communities is a substitute for a regular bus service, so these people have a double whammy - no regular bus, and now they have to pay for the privilege. That'll fire the enthusiasm up! And that was it. A nice idea that gave no room for optimism. I'm not sure what SCC expected to gain from this, except to be seen consulting with the public, but when I got home I looked at the lovely bus stop across the road, and try as I might I couldn't envisage it being back in use anytime soon. So, moving on, and a couple of weeks ago I went, with Roy from East Norfolk Bus Blog, to see Borderbus's latest Scania, and very smart it is too. Yesterday, Borderbus's Diplomatic Correspondent, Bernice Carver sent me a couple of pictures with the Scania sporting its new registration of BB61 BUS. That means the 6 Scania deckers carry the registrations BB53/6/7/8/9/61 BUS. BB58 being the only double door example. Many thanks, Bernie. I was asked a serious question by an operator this afternoon - that question being is Contactless vitally important on rural services? I know what I think, but I'd be really interested in what everyone else thinks. Is it worth spending many thousands upgrading ticketing equipment to enable contactless payments? Let me know what you think. Finally Go Ahead's figures for the last year have been published., including the final year of Anglian I will publish them below but make no comment, as they speak for themselves. Finally finally it's always interesting when someone outside the area comes for a look at things. Roger French OBE, for 25 years MD at Go Ahead owned Brighton & Hove did just that last week, covering Colchester, Ipswich, Southwold and Norwich, with many places in between. He spends his, I presume, blissfully happy retirement touring the country, sampling bus and train services, and writing reviews. His speaking sand writing services are in high demand, and when Roger says something the industry normally jumps. You can read his interesting and forthright review by clicking here, and again I'll make no comment, except to say a lot of it is rather familar. First of all my apologies to Steve Lee, who sent me copies of the First Ipswich 2005 timetables. I was going to do a comparison with today but it was just too depressing. Thanks Steve - we'll meet up for a natter. At the end of my last post I said something had died in me. That spark, which got me out, sometimes at silly times to follow my hobby and report back has been extinguished. There's a test train tonight, maybe going to Sizewell, and you know what? I just can't be bothered. I think it's only fair to tell you why, as you have supported me for so long. One of the reasons I started this blog back in 2013 was not only to share my passion, but to hopefully lay the foundations of a career back in the industry I love. At first I thought that might be in the written media, but no. I'm too forthright. If I don't like something I say so, and I'm not afraid to speak the truth. Much of the public transport media doesn't do that. 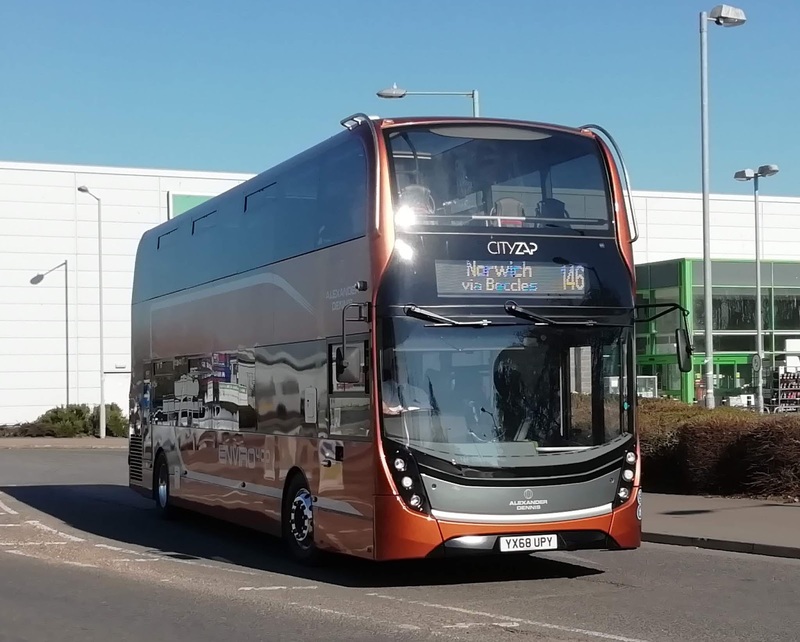 It likes its cosy relationship with operators/manufacturers too much, and won't point out the obvious like new buses that rattle or rail operators treating customers worse than cattle. Maybe I'm not diplomatic enough for that. Then I started looking locally. I had seen the bus network in this region literally crumble in front of my eyes and I felt powerless to do anything about it. When I relayed my frustration on these pages I was quite often told rather bluntly to do something about it. I wanted to. I still want to. I believe my observations over the last 6 years have shown me what works and what doesn't, most of all that East Anglia is a unique area, and unique strategies are needed. Go Ahead tried to run their operations here like everywhere else and look what's happened. First, despite the great efforts of Chris Speed, wouldn't be in nearly the position they are if Go Ahead had taken the trouble to listen to anyone. I cannot think of a route operated by First that has more services now than it did 6 years ago, new routes excepted. I'm happy to be corrected. Many independents have gone to the wall in that time, and the biggest victim of all has been the passenger. But amongst the carnage there have been one or two phoenixes. It is no surprise whatsoever that the men behind the phoenixes know the area and the people like the back of their hand. Julian Patterson left Konect to form Lynx, who have basically taken over in Kings Lynn. Yes, they were helped by Stagecoach making as big a mess of the former Norfolk Green as Go Ahead did with Anglian - someone else who didn't recognise the unique strategies required, but Lynx were doing well anyway. The other phoenix is Borderbus. Smaller than Lynx, but just as successful. A lot of 146 jouneys now require deckers, as opposed to mini Darts when the route first started. But their shining light, and inspiration for me is the Beccles Town Service. The success of that route proved to me that if you actually take the time to involve the local community with their bus service they will support it to the hilt. So if it works in Beccles why not other parts of the county. There are larger parts of Leiston not served by buses for example. It's a half hour walk from the nearest bus stop to the job centre, and there must be people crying out for a bus service to take them to Tesco and Waitrose in Saxmundham. Yet no one asks them. I wanted to. That is just one example. There are many more, including those I mentioned in my last post. While I'm on that topic I mentioned a new development in Melton that had a bus stop one side but no means of crossing the busy road to get to the other. I'm pleased to reveal that a new pelican crossing has appeared, which although it must cause utter chaos with the traffic leaving the A12, does mean bus passengers can cross the road. If communities want bus services, particularly rural communities then those communities have to support the service. In this region the way to do that is to make them feel part of it. That has been proved with the 62, a little minibus that operates between Woodbrudge/Framlingham/Saxmundham. 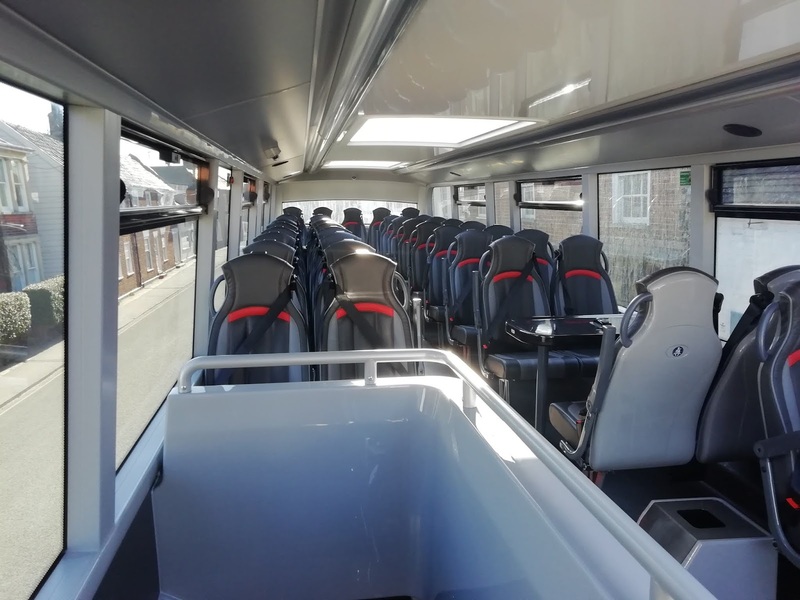 The Saxmundham journey only operates on Wednesdays, and Nigel, the driver for PF Travel has re-written the timetable many times after listening to feedback from his regulars. When I saw him loading up for the return journey from Saxmundham a couple of weeks ago I thought he was going to have to leave some behind. I have no idea how he squeezed so many AND their shopping trolleys on board. In the grand scale of things insignificant, but to those 15 souls on board an invaluable lifeline, which only survives because the operator worked with the community and listened. It has retained its subsidy where many others have lost. So I wrote to Giles Fearnley, MD of the UK bus division of First Group, and put the idea to him, that someone who worked with communities and village/town councils to encourage bus use, as well as investigating grievances such as bus stop removal or service withdrawals could be worth a go, bearing in mind First in Norfolk & Suffolk are now making healthy profits, and working with communities would only enhance their reputation as well as building business. Chris Speed had encouraged me to write, as he was enthusiastic about the idea when I discussed it with him, but said he didn't have the power to create the post. I got an email back from Giles Fearnley basically saying sod off. At no point did he mention communities or liasing with them, or give any reason whatsoever for rejecting the idea. That's what winded me, not that I hadn't secured a job, but that he gave the impression he couldn't care less. He didn't want to try to build the business, interact with customers, ride into areas without a bus service on his lilac horse. That hurt. Not just personally, as the last 6 years have been building up to that, but I hurt for the area I love too. Those people and communities who could have benefited. The youngsters who will still have to rely on parental lifts everywhere, and their grandparents, who will have to carry on driving, if they can, far longer than they should because there is no alternative. My guess is in 5 years there will be nothing left. Not unless there is a huge change of attitude and ambition from those who are in the position, and have the power to make a change. Don't hold your breath. I think this time it's terminal. So, I have to look in different directions now. The goal I've been working towards for the last 6 years has been dismantled. I was hoping my hobby would become my career again. It hasn't and I doubt it will now, so it must return to being just that - a hobby. However, I'm not just going to walk away from 6 years work, and more importantly the people who have inspired me to carry on over the years. So I'm going to carry on, only with a difference. I'm only going to report positive news. Granted that won't mean much from here but I'm sick of only having negative news to report. That is going to start right now. 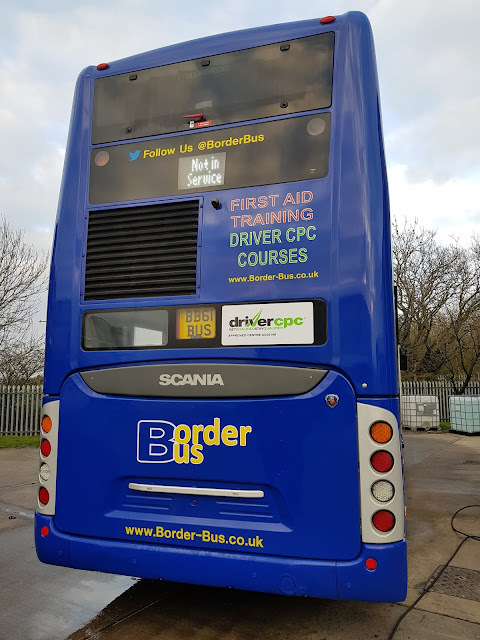 Starting on 23rd April Borderbus are going to take over the 90 from Konect operating from Beccles to Halesworth and Southwold. Except it won't be called the 90 anymore. Borderbus have reverted back to the original Anglian numbers of 522 and 524, which makes sense as they also operate the Halesworth - Aldeburgh 521. Some good news for Halesworth is that the Dukes Drive estate is getting a Beccles service back, after the brains at Go Ahead decided all passengers in Halesworth lived by a car park and stopped the bus going round there. The only journey to go is the late afternoon service from Beccles to Halesworth, but I'm not exactly surprised at that. And finally, and this is the sort of thing you'll be seeing more of, someone is tackling the age old problem of feet on the seats. It was a battle that was never going to be won, so Martijn Gilbert, supremo at Go North East, which is as different to Go East as curry is to ice cream, has come up with a solution - the feet seat. On those rear facing seats that are prone to having feet placed on them he has designed a tip up mechanism for the seat, leaving a space for feet to be placed. If someone needs those sears they can be put down and used with no shoe residue on them. Simple but brilliant. Now to tackle the little scrotes who sit length ways on a double seat, with their knees up and feet on the outside seat. Martijn has kindly sent me some pictures of his new brainchild. Except I'd post them if I could save them, which 3 devices won't let me do, so here is the official publicity! Click here, and I'll ask Martijn to resend the extra pics he sent me. I did start to worry about losing contact with those friends I've made over the years, but then it dawned on me that the likes of Chris Speed, Andrew, Dave and my mates at Borderbus, Martijn, John Bickerton at Reading Buses, Ross and the incredible team at Ensign, not to mention my old(er) school percussion partner down at Stagecoach Southeast (remember Tom Sawyer) are going to be just the people who'll be giving me the positive material to report, so no worries there! Next post when I have something nice to report unless someone relights my spark! I should have been out today. To all intents and purposes I was going to catch the 1815 from Norwich to Halesworth - the last time a through bus will have operated the route for the foreseeable future, perhaps ever. 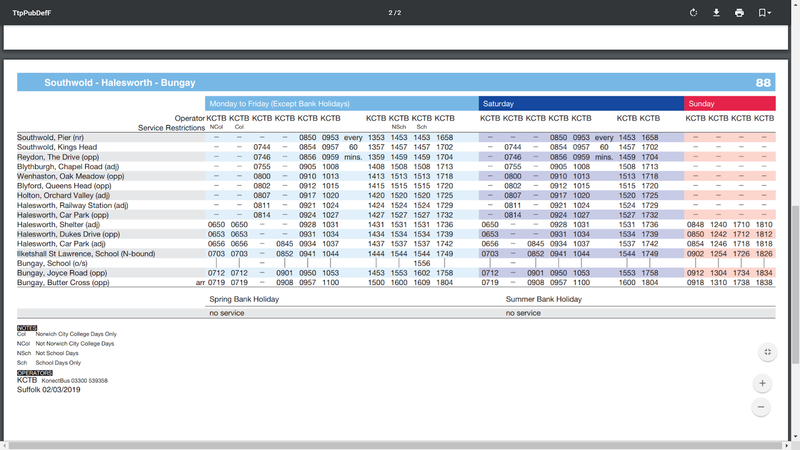 From tomorrow a change at Bungay and operator will be required, then from 1st April, how appropriate, just 5 buses a day will run between Southwold and Bungay via Halesworth. I wanted to be on that last through bus to mark the occasion. And you know what? I couldn't do it. I couldn't be there to see the death of yet another bus route. I've done it too much over the last few years and I've had enough. I've had enough of reporting negativity surrounding the bus industry in this region. I've had enough of watching operators not give a damn about their passengers. I've had enough of watching vital community links vanish or shrink to a fraction of their normal size when Government departments are wasting our money like it's confetti, at the same time demanding our Councils remove wardens from sheltered housing, make parents buy textbooks for schools, and force residents to pay to have their garden waste taken away. Can you remember the last positive thing I had to say about the bus industry in East Anglia? I'm pretty sure it was the success of the Beccles Town Service once the users agreed to leave their passes in their purses occasionally and pay the fare to keep the service going. And why was that a success? Because Borderbus engaged with the community and told them straight - we'll provide the bus but it won't pay for itself. The community responded. The market was engaged with and the results speak for themselves. I've touched on this subject before, but I'm so pissed off right now I'm not just going to touch on it again, I'm going to stomp all over it in size 14 wellies then drive a Challenger tank over it too! In all areas of commerce firms spend millions on market research. It seems obvious that if you want to build your business and increase growth that you do your homework and find out where the best places are to grow your business. The High Streets are littered with people wanting your opinion on everything. Except your local bus service, where you'd like it to go, when you'd like it to go, and how much you'd be prepared to pay for it. In other words what would it take to leave your car at home and get the bus. Has anyone ever been asked that? We're told the Government want people out of their cars and on to public transport. Yeah whatever! That's why fuel duty has been frozen for years while bus and train fares have risen above the rate of inflation year in year out. That's why scrappage schemes for old cars were created but where was the incentive not to get a new car but switch to public transport? Politicians live on a different planet if they really think we'll believe all that. Why are buses blamed for everything from traffic congestion to poor air quality to the rise in poverty? . The answer is simple. Because the bus industry doesn't help itself. It is so aloof that it just assumes customers will come flocking to it, that the peasants will be on their knees in gratitude that they have been given a bus and tug their forelocks in respect if a manager is seen. Except that's not the case, as I've reached the conclusion this week that the bus industry does not see it's customers as people. There are exceptions of course, and we know who they are as they stand out like a sore thumb, but in general no bus company gives two hoots who has a bus service and who doesn't. They'd much rather go after the passengers of other operators than find new ones themselves, and that's going to happen again in East Anglia before the year's out believe me. It's easier, you see, less work needed. The punters are already there, just entice them off one bus onto another. We've seen it time and time again and who, in the long term benefits from it? Certainly not the passenger. Take Kessingland, near Lowestoft as an example. Anglian Bus were doing just fine there, 3 buses an hour, 2 going to Southwold, 1 to Kessingland Beach, and 1 every 2 hours to Halesworth. In the other direction 3 buses an hour to Lowestoft, Great Yarmouth and Norwich. First thought they'd have a piece of that so started the 99, cut fares that Anglian stupidly didn't match, finally saw Anglian off and now Kessingland has a 20 minute service again. Except there is only one an hour to Southwold, nothing to Kessingland Beach or Halesworth, and no through service to Great Yarmouth or Norwich. The 146 goes through Kessingland but not round it, as it really should do, so that's scarcely a substitute. Where there are bus wars, in the end the passenger is the one who suffers most. Let's move further into Suffolk now, and to Ed Sheeran's Framlingham. It has basically doubled in size over the last couple of years with extensive housing developments. I don't know the exact amount but no one locally has contradicted me when I've suggested over a thousand new properties. I'm told by the architect whose office is below me that all new developments must take transport links into account when planning. Ok, now we've all stopped laughing I'll continue. Framlingham lies at a meeting of several winding country B roads. Improvements to local roads equals zero. The Framlingham railway line from Campsea Ashe (Wickham Market) closed in the 1950's, there are no local taxi firms I know of, and buses? Well, there's the Galloway 118/9 cross country service to Ipswich. It runs at uneven times, goes nowhere near a major supermarket, or a useful station. It's sponsored so under constant threat. 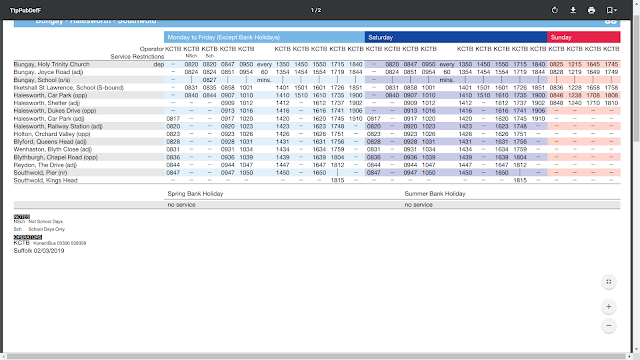 There's also an off peak return service to Diss, and a little minibus to Woodbridge, again off peak, that runs to different times on different days. Again both those buses are sponsored. So you'd have thought an operator like, say, First would be thinking "hey, there's close on 2,000 people there without a decent bus service - let's go get them" This is where market research comes in. Liase with the local council and community groups to survey the residents to see when and where they want to go. If a community feels consulted and valued it will respond, as it has in Beccles. My guess is a decent link to Wickham Market station would be high on the list, and that's where you link up with Greater Anglia to encourage use - anything from a free coffee at the station to 50% of your bus fare off the rail fare, the possibilities are endless. Hell, Wickham Market hasn't got a bus to Wickham Market station, and it's a 3 mile walk down a busy road with no pavements! Connect with the 64 and bingo. But no, too much like hard work doing the research and unlike any other industry Heaven forbid they actually employ anyone to do the market research. Another big development has recently sprung up at Melton near Woodbridge. To be fair a new bus stop has been sited near to the entrance to the development. Unfortunately that road is just off the A12, is ridiculously busy, and crossing it to get to the stop the other side is darn near impossible. Why haven't First kicked up a stink about that? I assume they want customers to be able to get to the bus stop. On second thoughts maybe not, as they recently rerouted the 800 so it missed out Melton Village, forcing customers, many of them elderly to cross that same road. I can guarantee no one at First will have the faintest notion how that has affected people. Well they have as I've told them, but no one has followed it up. And that sums things up. No one gives a damn, no one wants to give a damn because if passenger numbers fall on rural services then it's the excuse to cut services, forcing cash strapped councils to step in, which means heavily reduced services which passengers will abandon, leaving the route to die. It's as though the operators just aren't interested in rural communities, even though if the service is right the loyalty will be steadfast. And that's the most infuriating point - they don't want to know and give the impression they couldn't care less. 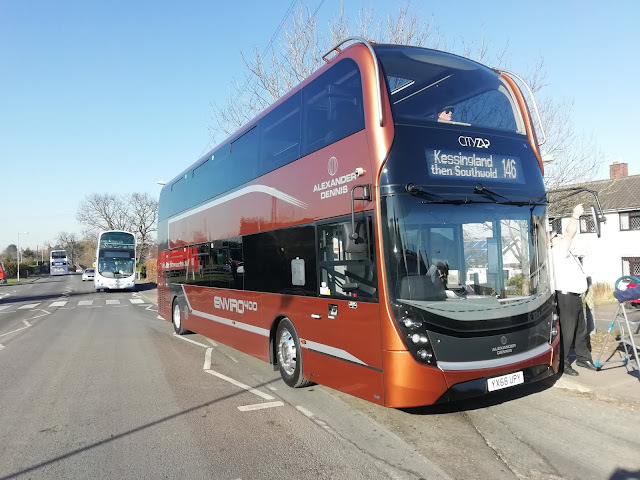 Brian Souter, Chairman of Stagecoach said recently that the bus industry is lagging behind in Research and Development. There's an understatement. I read an interesting blog on that point today, and how bus operators are all too quick to blame outside influences like congestion, but never look at themselves. You can read that blog by clicking here. 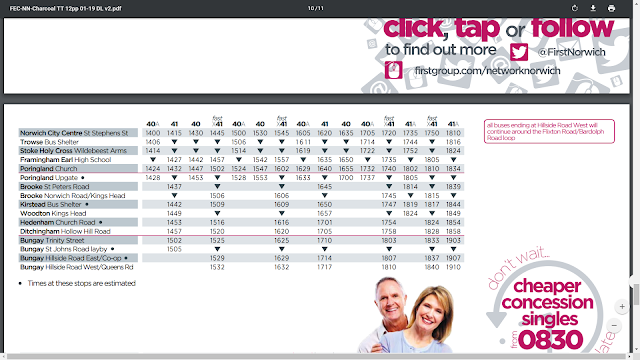 Before the Bus UK AGM in London last month Giles Fearnley, MD of First Group said in an article that bus operators needed to interact more with their passengers. Actions speak louder than words, Mr Fearnley, and this week you have proved to me they were simply that - words. I can't go into more detail but his response to an email this week was the genesis of this post, and why I now firmly believe that nothing short of total re-regulation will save our rural bus services or in less than 5 years there will be nothing left. The horse and cart will make a comeback. At least it will be green. One final thought. Let's say someone living in Halesworth gets the bus to Norwich, and two workmates board further down the route in Bungay. From next week it's likely that Halesworth resident will be forced to take the car, assuming they drive, but it could just easily be a college student whose parents now have to drive them. So they say to their colleagues if I have to drive in I may as well pick you two up on the way and we can share the costs. You've then lost 2 passengers from the surviving part of the route as well as the one dumped on. Then people will scratch their heads wondering why loadings are down. So Smurfy, my friend, you keep asking about the future of First Essex. If I'm honest, if the current attitudes prevail I'd say it's got no future. As the good book should say: Happy are those who live in Ensign's area, for they shall have buses. Oh - and the ultimate irony - there was a "Transport Day" in Croydon today, because they don't think their transport is affordable, accessible or clean enough. That's the Croydon that has 24hr bus services that have a flat fare of £1.50, Freedom passes giving free travel on bus, tube, tram and train, At least 10 trains an hour into Central London, when they run, and a fleet of buses the huge majority of which are Euro 5 or 6. Oh, and trams that are the greenest form of transport there is. It's a bloody public transport Utopia and they're not happy!! Tell that to the people of Kessingland, Halesworth and Framlingham! Or the increasing number of communities in East Anglia who have nothing. Makes you spit. I must thank Grahame, Zak and Kieran for sending me pics of the old 588 I was going to use in a post commemorating the route that ended today. Sorry, but I won't be doing that post now, it's too depressing. That's why I wasn't on that final departure earlier. Something has died inside me too, and I fear it may never return. It's been sometime since Borderbus managed to wrangle a demonstrator, so when they announced yesterday that one was on the way it aroused interest in many quarters. This particular demonstrator turned out to be an extremely eye catching ADL E400MMC. I was out bright and early (for me) to catch a ride on it and see if it managed to impress me anymore than previous MMC's, which have left me feeling distinctly underwhelmed. First of all this bus looks stunning inside and out. The MMC has an attractive body (no sniggering at the back) and the interior is up there with the best I've been on. 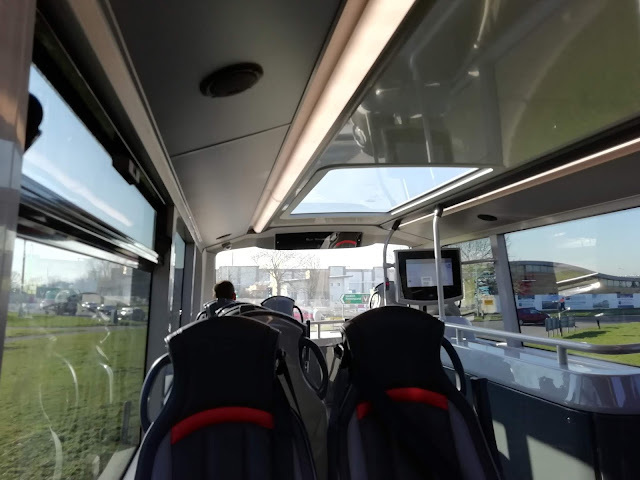 Light and airy thanks to the glass panels in the roof, seats which look comfortable, USB charging, wireless charging if your phone is enabled, tables, air con, even a radio. And those seats on an E400 that are normally rock hard - over the wheel arches and back seats were fully padded too. However, then the wheels start turning and the usual frustrations emerge. The suspension is just too hard - Roger French's coffee cup test would fail abysmally - and there is just too much body creaking and rattling. I was told once that was because lighter materials were being used to keep the weight down. Poppycock! The engine is smaller than they were 50 years ago, yet the bus weighs over a tonne heavier than they did 50 years ago when they didn't rattle! The engine, as it happens is extremely impressive - very powerful and gave a decent kick down when needed. The brakes are smooth and even, although that might have been Terry's good driving. One word about the seats - initially very comfortable after 30 mins or so you begin to notice the lack of lumber support and by time we reached Southwold I could feel my back more than I should have done. Now you will know I always ask the driver their views. Today I didn't have to as Terry let me know what he thought of it the second I stepped on board. He loved it! Said it felt like driving a coach, not a bus. The only quibble he had was the cab was a tad cramped and he couldn't fit his bag in it. Other than that he was one very happy bunny. A very considerate bunny too as he made a point of slowing down whenever he saw anyone taking a picture of the demonstrator, and there were a few. Extra useful today as the (very welcome) sun made photography very challenging at times. Terry isn't an enthusiast, but respects those who are, and that is a rare quality these days. Cheers Terry - more than one person asked me to say thanks! One Terry slowed down for, at Pakefield. So my verdict? Yet again I've alighted from an ADL demonstrator frustrated that it could, and should be the perfect bus, but just isn't. There is so much potential there if the suspension was softer and the body that bit more robust to get rid of the Poundland type quality noises it emits. I'm going to ride it again this week, then jump on a B9 Gemini 1, which is my benchmark, to get an instant comparison. I think it will confirm my feelings, but if anyone else rides the MMC and has a different interpretation then please share it - I can only say what I think after all! As I got off the demonstrator I almost literally bumped into Roy Northcott of East Norfolk Bus Blog, who I haven't seen for months. They were flooding the area, as I had passed Graeme Bessey from the same esteemed blog earlier on. A decent natter with Roy ended up with us both driving to Beccles to pay Borderbus a visit as their latest Scania Omniciti decker was being vinyled up, bringing the total number of Scania deckers to 6, and don't be too surprised if that's not the last. YR61 RUY was new to First London before passing to Metroline. I must say they do look good in the Borderbus/Ryan Air livery, as good as anything new on the road. A good natter with the Borderbus crew ensued, including Bernice having a right royal rant about the inconsiderate parking of buses in St Stephen's St - there are times I'm so pleased she's a friend! 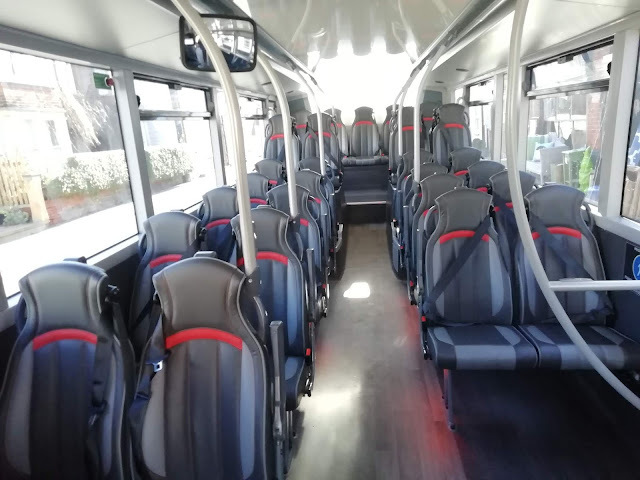 Anyway in other news Enviro 200 BB11 BUS, which had a smoking time on the A146 a few weeks ago is away for rewiring, and hopefully Scania decker BB53 BUS will be going away to have padding introduced to the seats soon too - the padded seats are proving very popular. 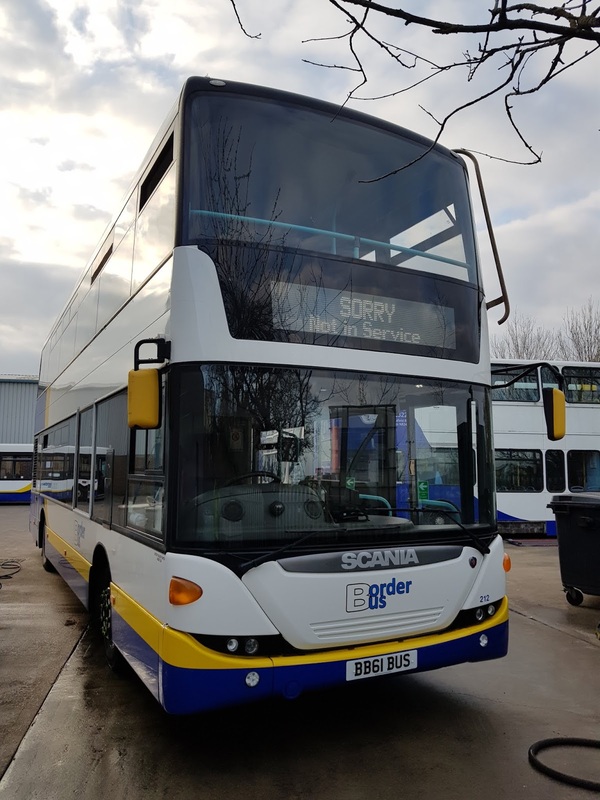 Two of the Volvo B7tl Presidents have been withdrawn and are currently donating parts. Roy's blog has details of which ones as I've already forgotten! The timetable for the new 99A was released yesterday, and it really isn't good news for those on the route used to an hourly service. 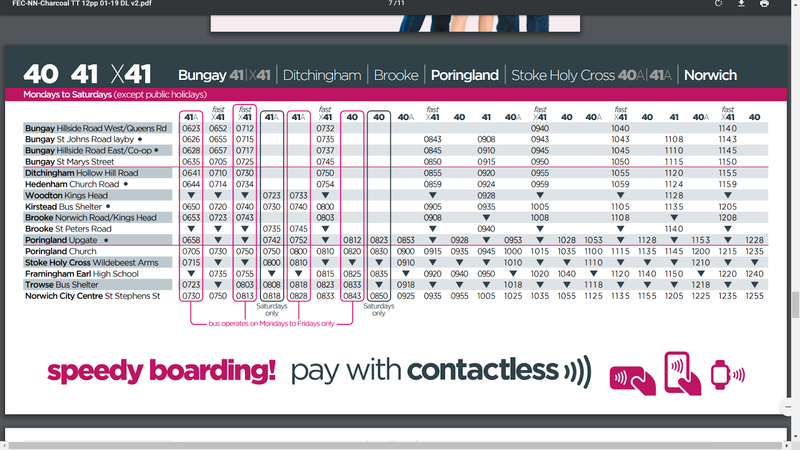 Just 5 journeys a day will operate each way between Southwold and Bungay, for connections to Norwich, not even guaranteed connections. The former BH272 school service between Blythburgh and Bungay High School has been renumbered 99H and is available for anyone to use now, though who in their right mind would want to is debatable! 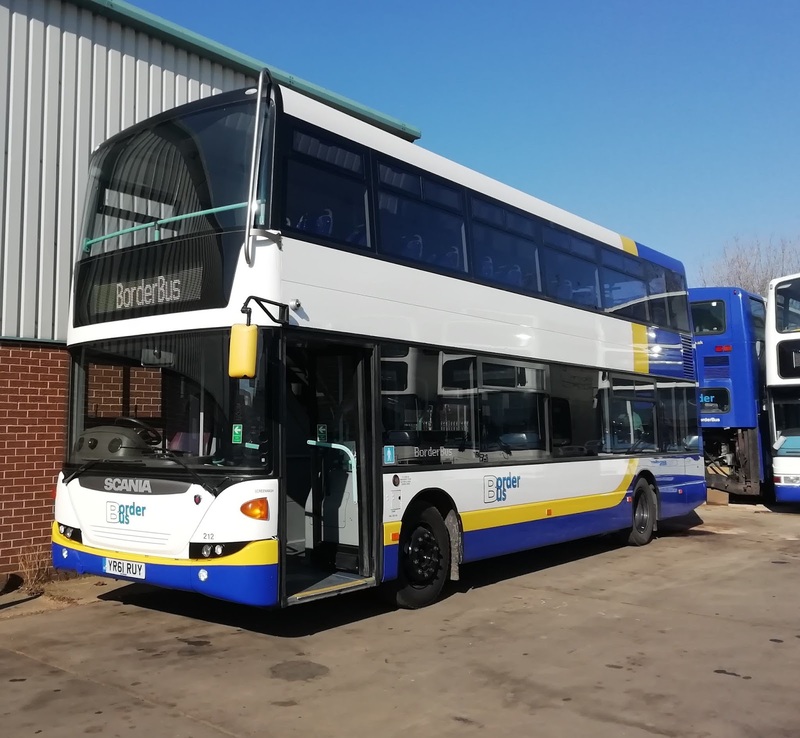 No new timetable or operator for the 90 has been announced yet, although it's possible that those Halesworth residents who used to use the old 62 to Beccles but were left stranded when it was removed from the estates might have some good news. Many areas have suffered badly due to bus cuts in recent years. Many locations have lost their services altogether. But not many towns have suffered more than the Suffolk town of Halesworth. Recent years have seen the link to Lowestoft axed, the Norwich service cut to the bare minimum, the Beccles service greatly reduced and removed from the parts of the town that used it most, and even Demand Responsive operators have greatly reduced their services to the town. Then, last month, as reported here, Konectbus announced they were withdrawing the 88/87 Norwich - Bungay service from 2nd March, and the Bungay - Southwold section of the route from 29th March. It has been announced this week that First Eastern Counties are going to introduce a 99A Southwold - Bungay service from 1st April, however this will be only a 2 hourly service, the timetable yet to be published. One would assume it will connect at Bungay with the X41 into Norwich. However, for the month of March, if you wish to travel from anywhere between Blythburgh and Halesworth to Norwich you are, to put it mildly, screwed. "This change will mean that there will be no through buses between Halesworth and Norwich. We will still be running the Southwold to Bungay via Halesworth route during March. Passengers will need to change buses to a First bus in Bungay. This will mean buying two separate tickets for the journey and we will be reducing the price of all tickets between Halesworth and Bungay during this period so that customers will not have to pay more money. We will also offer refunds on tickets that can no longer be used for all or part of the journey. We do not have final details of the price change yet." I draw your attention the part that says "we will be reducing the price of tickets between Halesworth and Bungay". Never mind if you live in Blythburgh, Wenaston or Holton then. But that actually doesn't matter, because if you catch the first off peak bus out of Halesworth, as many do, you'll have a 53 min wait for the X41 to Norwich. Isn't that caring! So I doubt many will be taking advantage of the cheaper fares. You can get the 1031 out of Halesworth and only wait 15 mins at Bungay for the slower 2 hourly 41, but that means you don't arrive in Norwich until after Midday. 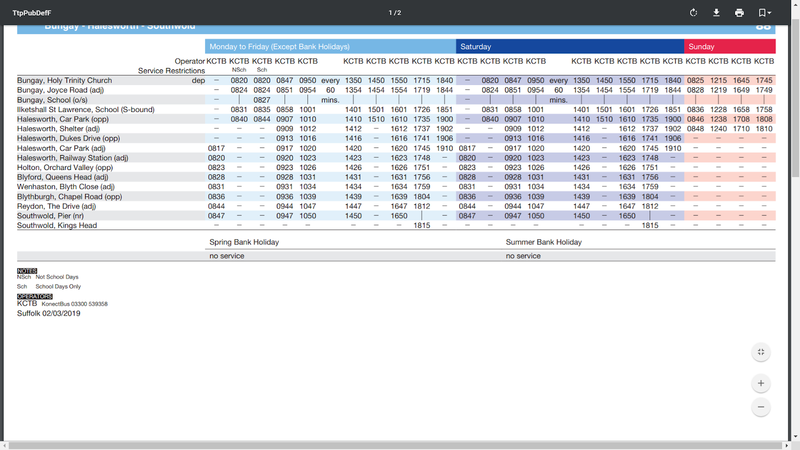 Click on the timetables for bigger view. Returning isn't much better. You'll have a minimum 25 minute wait at Bungay for a connection to Halesworth. The afternoon peak gives 3 buses at 1550, 1715 and 1840, but at least the last two services connect well with First services from Norwich, as long as they are on time. I really wouldn't hold out too much hope of the 88 waiting if the X41 is late. 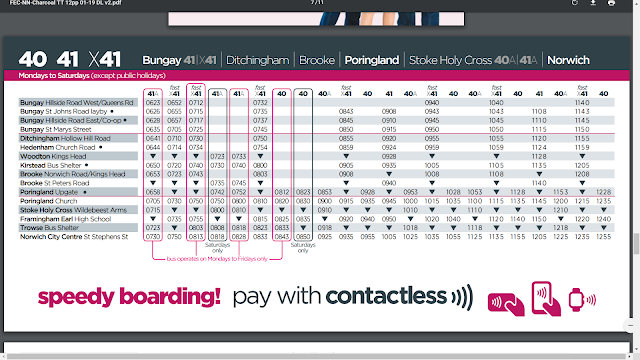 One can only hope that things improve when First take over the entire route, although I'm disappointed there will still be a change at Bungay required. This was an opportunity for First to engage with the people of Halesworth and get many lost customers back on the bus. Maybe it will happen, but a 2 hourly service isn't going to do much to woo people, especially with a change of bus involved. There is also no news about the services lost by Woodton and particularly Brooke, who in the space of a few months will have dropped from a half hourly service to a two hourly service. There is no news yet on the future of the 90, which is the Halesworth/Beccles/Southwold triangle. I understand Suffolk County Council are talking to 4 different operators. One side note - the new contract to operate the 87 between Norwich - Bungay evenings and Sundays has been awarded to......Konect!! Except it's been renumbered 40/41 to match First's services. The Bungay to Halesworth section has been scrapped unless SCC step in, but even if they do you know it will be a different operator and nothing will connect with each other. There is an opportunity for a Bungay - Southwold Summer service linking with the East Suffolk Line at Halesworth if the will is there. The one and only positive I can see thus far is that the Halesworth - Lowestoft link will be re-established, although you'll have to travel via Southwold but anything is better than nothing. However, I accept that these arrangements have had to be done fairly quickly, without much time for consultation. The good people of Ilketshall, Halesworth, Holton, Wenhaston and Blythburgh will have to hope these are purely interim services, and something more attractive and permanent is forthcoming not too far in the future. Either way, Konect are saying thank you and goodbye to the folks on the 88 who have stuck with them by giving a giant middle finger. There's gratitude for you. I always welcome comments about my posts - don't be shy and say what you think! All views and opinions, unless otherwise stated are mine alone. I am not affiliated to any operating company or tendering authority. I want to publish as many positive posts as possible, but I am a passenger before spotter, and I make no apology for consistently challenging both tendering authorities and operating companies to provide an increasingly improving public transport system that provides reliability, convenience, comfort and value for money. Anyone is free to contact me with any concerns at anytime. All pictures and information within blog posts are copyright and not to be republished or copied without prior permission and/or due credit given. Please note this link doesn't take you anywhere - paste the address into your address bar. Steve's Multi Coloured First Post!